This is a list with short descriptions of the top-of-the line features of Telerik's RadDocking control. WPF/Silverlight Code Compatibility - the WPF RadDocking shares a common code-base and API with its Silverlight counterpart. That means that you can achieve close to 100% code reuse for your grid logic if you have parallel Silverlight/WPF development. 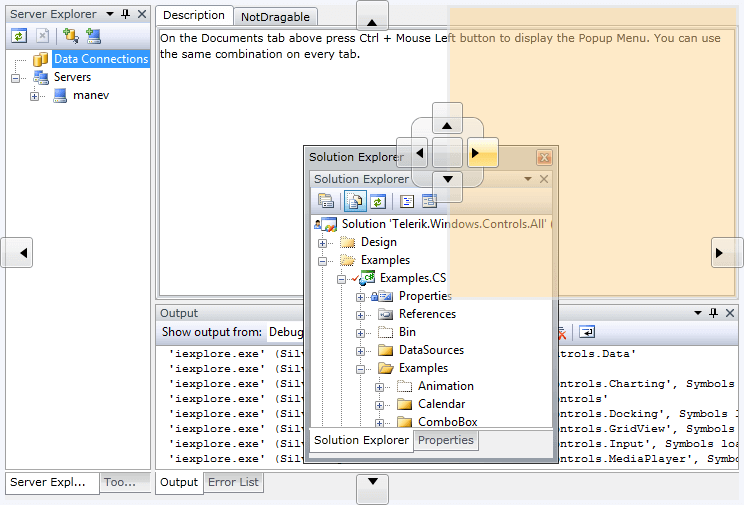 Expression Blend support - all UI for WPF can be easily customized using Expression Blend. Enhanced Routed Events Framework - to help your code become even more elegant and concise, Enhanced Routed Events Framework for the controls from the UI for WPF suite is implemented. This gives you more freedom when you design your applications, since you can write instance handlers as well as class handlers for the routed events of your controls. Codeless Test Automation for Docking - Now you can record, execute and debug functional tests for Docking without leaving the familiar Visual Studio environment. Telerik WebUI Test Studio is an advanced click and play web application testing tool specialized for automating both AJAX and Silverlight applications. The Studio ships with special translators for Telerik controls from the UI for WPF suite for ASP.NET AJAX and Silverlight.